Ryobi’s coming out with some new tools, just in time for the 2015 holiday season. Most will be available by November, but the vacuum might not hit stores until December. Without further chit-chat, let’s get right into it. 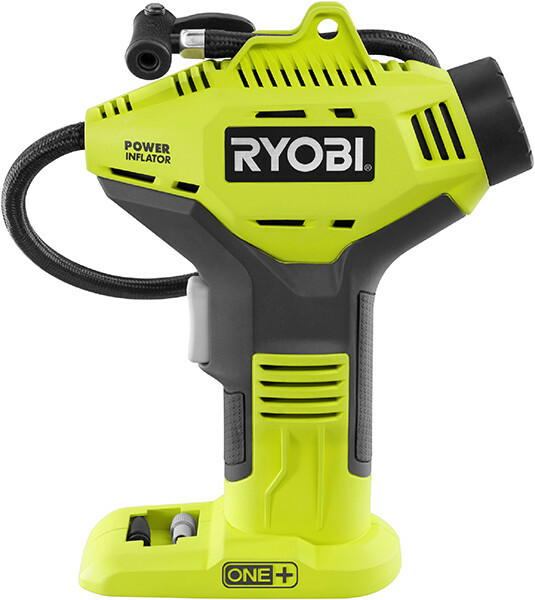 The one I find most interesting is the new Ryobi P714K Evercharge hand vac. 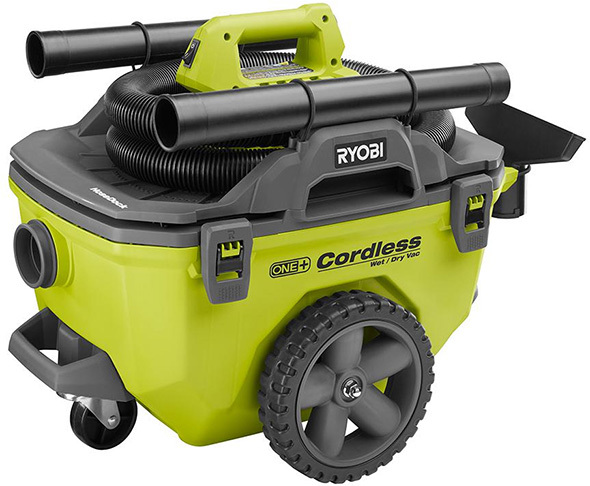 It’s got a traditional DustBuster hand vac look to it, and while Ryobi has offered hand vacs before (latest model preview, previous vacuum review), this one comes with an 18V One+ battery pack and a recharging station. 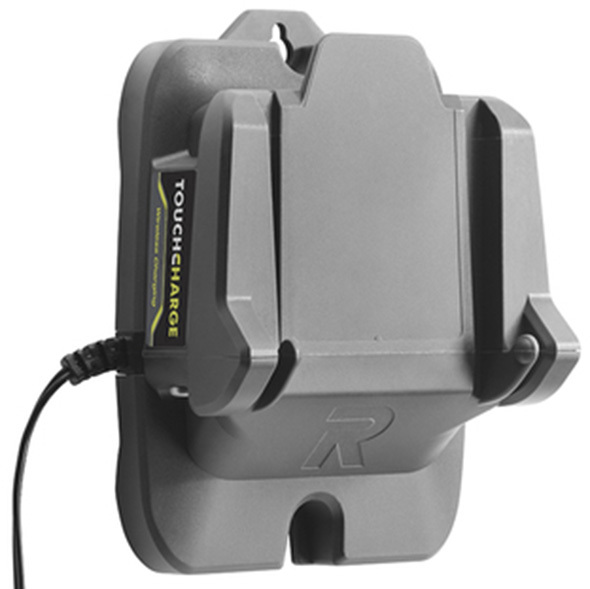 The Ryobi 18V One+ Evercharge vacuum has an internal charging system, which keeps the battery charged and ready when the vac is placed on its wall mount adapter. Ryobi also says that the new P714K vac is 20% quieter, compared to their P713 vacuum. Then there’s the Ryobi P737 cordless inflator, which can pump out air at up to 150 PSI. It’s got a 2-inch pressure gauge, 20-inch hose, and comes with a sports ball inflation needle and nozzle accessory. Ryobi came out with a compact cordless corner finish sander earlier this year. Now, they’re coming out with the P411 cordless random orbit sander. 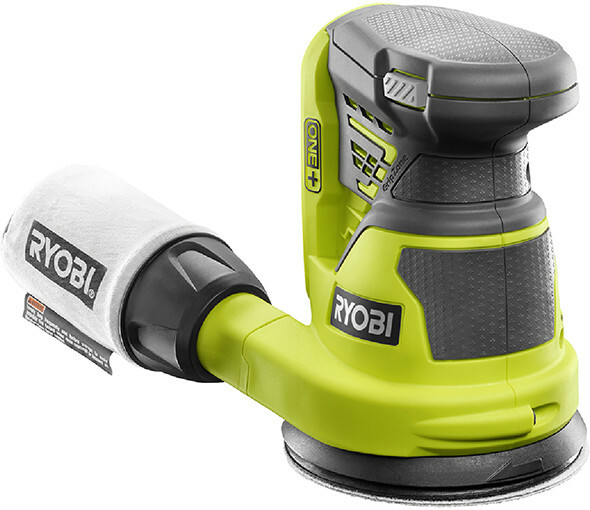 The new Ryobi 18V sander features a 5″ pad, 10,000 OPM no-load speed, and 3/32″ orbit diameter. Ryobi says that it can run for up to 35 minutes on a single (4Ah?) battery pack. Ryobi came out with a new compact Bluetooth radio earlier this year, and now they’re coming out with a bigger one. The new P746 18V jobsite radio features an AM/FM tuner, auxiliary input, and Bluetooth connectivity. It also has a 2A USB port for charging your personal electronics. 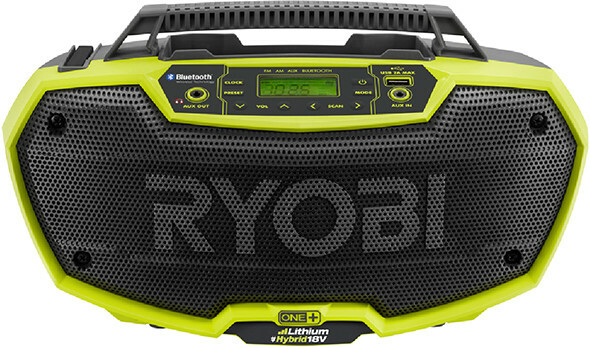 Ryobi says that their new Bluetooth radio is built with 2 “ultra-premium” 7W speakers with separate amps for clear sound, and 4 bass ports for deeper sound at all volumes. The new radio can be powered by an 18V One+ battery, or with AC power via a user-supplied standard extension cord. There will also be a new drilling and driving bit set, AR2083, which looks unremarkable, except for the DOCKit storage system. The set comes with a hard-shell case and wall-mountable docking station that can fit other DOCKit accessory storage cases. 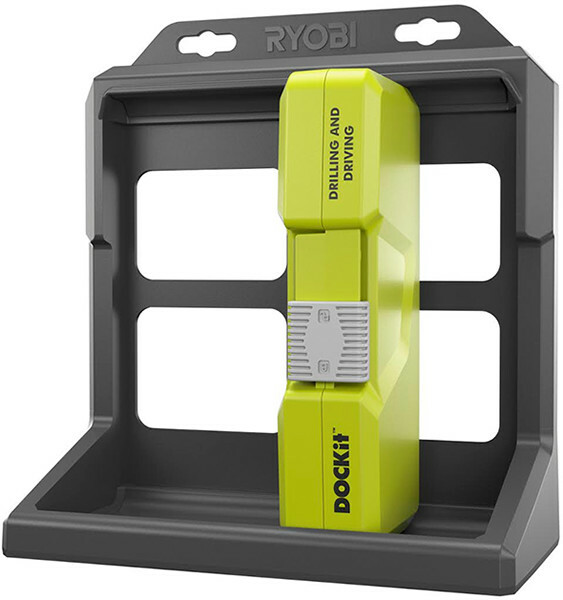 I mean this in the nicest way: too bad Ryobi didn’t come out with an empty DOCKit system that can be used with other brands’ bits, blades, and other power tool accessories. Not that Ryobi accessories are bad, I do own a set or two myself, but they’re not my top choice in most situations. 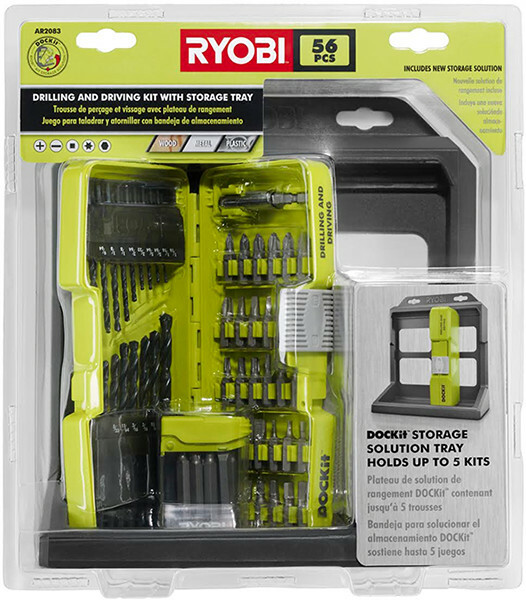 It’s also unfortunate that they still haven’t decided to bring their Ryobi ToolBlox modular tool storage system to the US. Which if these new tools would you consider buying? New Ryobi 18V Cordless Wet/Dry Vacuum 8 New Ryobi Cordless Power Tools and Accessories for 2018 Is This Makita’s New Promo Drill Kit for 2018 Holiday Season? Ryobi TouchCharge Wireless Charger – What Other Cordless Power Tools Will it Work With? « Have You Seen Our Super Awesome Ultimate Tool Gift Guide? You Can Help Out with Volume 2! The radio, hand sander and DockIt look like winners to me. I want to like the inflator, but it’s just too bulky and awkward. For what’s inside, most inflators don’t have to be much bigger than a pack of cigarettes (not including battery). 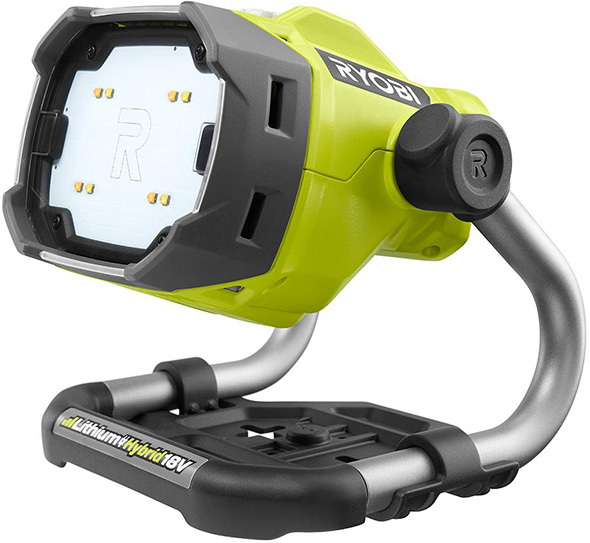 What is really curious to me is the Ryobi is going full tilt on 18v Pod batteries while abandoning the more compact Tek4. While a lot of people only want to own one system, expanding a Pod battery tool lineup seems like automating the buggy whip factory. Yes another inflator! Awesome! However their other one is already a homerun that works great and i love the digital display. I can see where this new one is more compact but i wonder what the duty cycle is before it burns up because its so smal? Although I don’t own any Ryobi tools, I will say that $25 looks like the right price point for an inflator. That’s why I like Ryobi tools. They can and do experiment with oddball add-ons. Makita, for example, could not do that, or you’d have a $100 inflator that no one would buy. Even if I had a Ryobi system, I personally would still not buy this even at that price. It doesn’t seem like a good fit for an emergency auto tire situation, I only use a hand pump on my bicycle, and I don’t remember the last time I pumped a ball. Still cool they’re experimenting! The recharging station and wall mount for the vacuum also is brilliant! I’ve run into this problem with my M12 vacuum, and it is currently leaned up against the wall in the corner with a pile of accessories surrounding it. It’s not a good look. Even if I found a nice bag or case to store it all in, it would still need to be tucked away in a closet or the garage. Now you wouldn’t be mounting the Ryobi in your living room either, but you could mount it right by the door to the garage and grab as needed. And $40 for a cordless RO sander? Ryobi really has smoking hot deals. The old inflator is great for stuff like trailer tires and tractors where they might not be sitting near a garage. Interesting you make that comment, I was recently talking to a professional contractor and I noticed he was using all Ryobi 18v tools. I asked him why and he was very honest and told me he’s used the other “big brands” and never saw much difference between yellow, orange, and blue brands. He went with Ryobi because they were inexpensive, offered a lot of unique tools others currently don’t offer, and if/when they get stolen they’re much cheaper to replace. I have heard this from a few contractors….all of whom are working on homes $500k and up. They often tell me they only see spending big money on levels, chop saws and blades. I’m planning on getting the inflator, I could really use a small, no-frills one like that. Having a cordless vac with a charging bay/dock AND a replaceable battery pack is a great idea made even better in that it uses a battery comparable with your drill/saw or whatever is kicking up the dust. Lastly, I really, really like the concept of the Dock-it system, but have enough driver bits and the like for now, but would definately go for the idea of being able to buy just the Dock-it boxes, and holder, so I could customize the assortment of bits I already have, to the system. Having all my bit boxes in one convenient tray, instead of a box here and there, is appealing. I’ve been a huge fan of ryobi for a few years now. The only thing that I’m hesitant about is the new radio doesnt look as tough/sturdy as the last one. But without getting my hands on it, its really hard to say. At $40 for a sander and $25 for an inflator, I’d have to agree that these are some well-priced, affordable tools for the homeowner. I’ve used lots of Ryobi stuff in the past, mostly corded tools, and they seem to be quite durable, even holding up to the obvious abuse by people who don’t take care of their tools. Makes me want a cordless inflator for the Bosch 12V Max system at least, I don’t think I’d want to buy a Ryobi 18V battery and charger just to use the inflator. The radio seems similar to the Craftsman. Would not be surprised if the internals are the same. Does it charge batteries? The old P745 does. The P745 had disappointing sound quality so hopefully this has been addressed. It looks smaller and doesn’t have a cage but this is probably closer to what DIY Ryobi users actually need. I never have my radio too close to the work area so no cage is not really an issue for me. If it charges batteries I will be buying one. The Craftsman C3 line and Ryobi line share tools and technology. I suggest people chose Ryobi over Craftsman though because of better pricing at Home Depot for tools and batteries for the most part. Craftsman wants 69 dollars for their inflator where the Ryobi version is 25 bucks that’s a big difference. The one thing Craftsman has that Ryobi discontinued is the canister style cordless wet/dry vacuum. Sure wish Milwaukee would jump on this bandwagon with an inflator and a Q-Beam style long-distance spotlight! I would love it if they’d come out with a small shop vac like Ridgid’s line. I love my Ridgid one at work. My Ryobi home tools could use one as well. I agree. A compact shop vac would be a nice addition to their line. Although I have replaced and sold off the majority of Ryobi 18v tools I have kept a couple including the current inflator. Its brilliant and I can’t understand why the other brands wont release one. Ryobi consistently punches above its weight with its variety and innovation. I love the idea of a dustbuster type vacuum that can use the 4ah batteries and be charged from the base as well. I’m probably going to end up buying both the vac and sander. I’m going to hold off on the radio, though – I was disappointed with the am/fm performance with the smaller green bluetooth radio. Bluetooth tech was nice, but I also like to listen to sports, and unfortunately, neither the older blue or the newer green radio could grab the stations I wanted to listen to. I’ll wait for some reviews to come in on the radio before I decide. While I don’t see Ryobi competing with my Milwaukee 12v line of tools that I’m pretty heavily invested in, it does fill a very competent niche for me, including the cordless planer, chainsaw, caulk gun, 16 and 18ga trim guns, chop saw, and trim router. They’re extremely versatile, fairly robust, and inexpensive. I picked up three cases of Ryobi drill bits (the kind with multiples of common sizes up to 1/4″, plus 3/8″ and 1/2″), which appear from these images to be the exact same case design, for just $5 each when they were on clearance. I bought them to be beater drill bits when I don’t want to use my large, expensive, finely incremented set. They have been EXCELLENT. WAY better quality than I expected. Obviously not a high end set by any means, but easily worth 4x what I paid. I wouldn’t mind a storage rack like that. I have a Milwaukee insert/driver bit set and the Ryobi drill bit sets that would make sense there. Maybe a travel set of basic router bits as well. But now that I’ve seen it I can make one of my own pretty quickly. Great idea. I wonder why I hadn’t thought of that before.